These finished onesies are available for sale in my Etsy shop. This week I am working on some new onesies that have an owl applique. 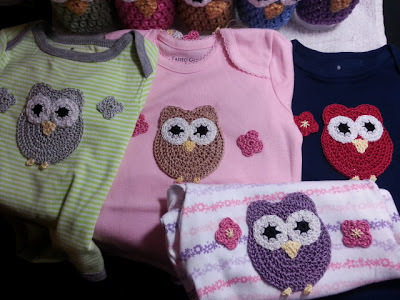 The owls and little flowers are made with #3 crochet thread. This makes them thinner motifs but still very sturdy. Using regular yarn appliques on clothing is not practical. It is too bulky and it just doesn't look very good. I purchased some nice little onesies in sizes from 0-9 months. I made the owl appliques using my crochet owl applique pattern. I did have to modify the hook size to a B hook because I used crochet thread instead of worsted weight yarn. To make these onesies, you can either sew the motifs on.... or you can glue them on with Fabric Fusion. I choose to use Fabric Fusion for two reasons. First, I really don't enjoy sewing. Second, because I think it secures the appliques much better than sewing. When using glues, be sure to place a lining inside the onesie to keep the glue from seeping through to the other side. I use a piece of plastic sheeting (an old sheet protector). When you get your owl motif made, make the little flowers. R1 - CH 2 and SC seven times in the second chain from the hook. Join with a SS. R2 - CH 2 and DC two times in the next stitch. SS in the next stitch. CH 2 and DC two times in the next stitch. Repeat this until you have four petals. Join with a SS in the first chain and tie off. Secure the loose ends by tying them together in a knot. 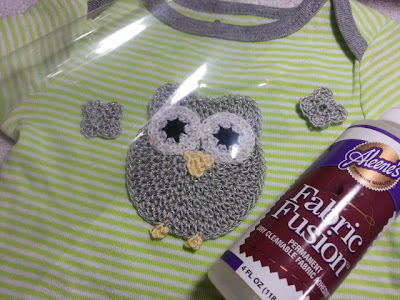 Now that you have the owl and little flowers done, spread glue onto the back of the motifs and place them on the onesie. Don't forget the lining!! Make sure to press down to make sure they adhere well. The glue should set for about 24 hours before attempting to wash. 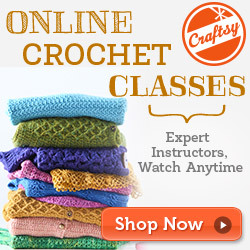 Remember, you can purchase the pattern for the big-eyed owl appliques online from Ravelry. 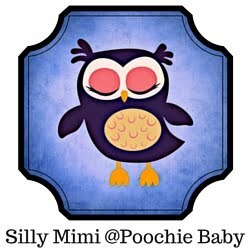 You can also purchase completed onesies in the Poochie Baby Etsy shop. Have fun making one of these cute little onesies! Please share with all of your friends. The share buttons are below.